The brand new Ducati Scrambler electric motorcycle by Peg Perego, with its roaring engine, is the spitting image of the original model! The set of Ducati electric motorcycles by Peg Perego boasts a new entry, a dream motorcycle with a roaring engine: the new Scrambler Ducati. 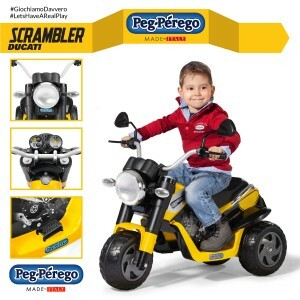 Dedicated to children aged two and up, the Scrambler Ducati is an electric motorcycle - made in Italy – with a rechargeable 6-volt battery (4.5 Ah) that reaches a top speed of 4 Km/h. The Scrambler Ducati is sure to impress right from the moment it is switched on, what with the sound of a roaring engine (in the act of revving up), a large operating headlight and two adjustable rear-view mirrors… the dream of every child (and many fathers). 1) Easy to drive. The Peg Perego “All in One” system makes driving easier, even for tiny tots. When released, the accelerator pedal becomes a brake that automatically slows down the motorbike. 2) Stable even when cornering. The three wheels and the iron handlebar guarantee stability and balance even when not in movement, without the child having to rest his or her feet on the ground. 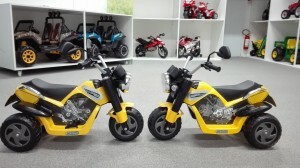 The motorbike comes with an attractive and comfortable saddle, smart footrests and useful rubber non-slip knobs, so that the child can focus on having fun. 4) On and off-road driving. 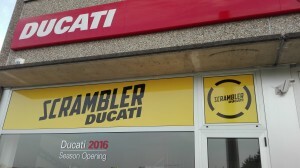 The Ducati Scrambler may be driven on smooth surfaces such as tarmac and cement as well as slightly rougher terrains such as tiles and cobblestones, thanks to its three grooved wheels. 5) Childproof Peg Perego safety. The bodywork of the Ducati Scrambler is closed at the base to protect the driver from electrical wires, to prevent tampering and to shield the vehicle from water, mud and sand. The 6V/4.5Ah battery, placed in the compartment under the saddle, is protected by a childproof battery fastener. The battery may be recharged using a common household socket, either directly from the vehicle or by first removing it from its compartment. The battery and charger are included in the box. Peg Perego has chosen the prestigious Ducati brand to create a line of electrical motorbikes worthy of a pole position! Peg Perego’s reproductions are approved by Ducati, in a partnership that promotes all-Italian style and design worldwide.